At PAWS Chicago, our No Kill commitment means that we give every pet the individualized treatment and rehabilitation he or she needs. 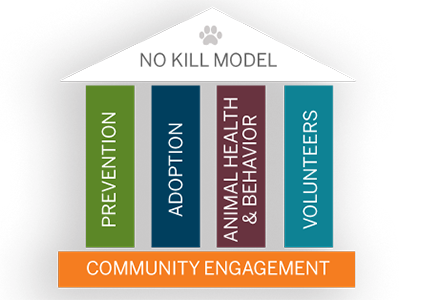 Saving every healthy and treatable animal is the cornerstone of the No Kill Model. But the goal is for each pet to not only survive, but thrive. Through state-of-the art shelter medicine and animal behavior programs, each pet receives full medical treatment and rehabilitation. Our robust shelter medicine program treats the physical body, rehabilitating pets suffering from illness and injury, while our behavior programs provide enrichment and training for dogs and cats who have challenging pasts—having suffered mistreatment, abuse or lack of socialization.These programs require industry talent and expertise, medical isolation facilities, trained volunteers and a network of fosters. In 2018, PAWS Chicago had a 98.12% “save rate,” even while taking in a vulnerable population of animals. Because of our expert veterinary and behavior teams, we are one of the few shelters in the country that can treat and rehabilitate a large volume of sick, injured and behaviorally challenged animals and give them a chance to be adopted into loving homes. We are working hard to continue to grow these important programs to save even more homeless pets at risk. For generations, getting sick in a shelter meant a death sentence. Traditional shelters “managed” disease by killing sick animals, and all pets in the surrounding cages. The No Kill movement has proven there is a better way. 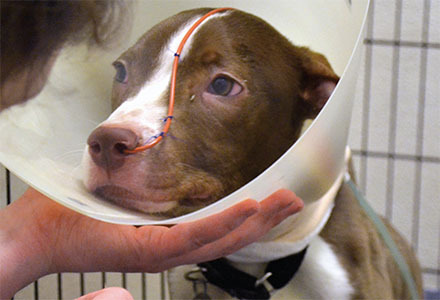 The PAWS Chicago Medical Center—the first stop for homeless animals when they arrive at PAWS—treats the most serious cases on site. We also utilize a robust foster network for pets receiving more simple treatment. Many of our pets come to us with emotional scars from the past. Some are terrified of people, other pets or loud noises. Others were never socialized in a family and don’t understand basic manners. Our Training Center enables volunteers and our team of dog trainers to work with dogs on obedience, manners and agility, giving them the enrichment and stimulation essential to a quality life while in the shelter, and also helping them find homes. Chet survived the streets of Chicago. We’ll never know where he came from, or how long he was fending for himself, but when we saw him at the city pound, we had to help. At 18 months, he was so severely malnourished that he was unable to keep any food down. In such a weakened state, he contracted pneumonia during his time at the pound. Our PAWS veterinarians rushed to action, providing him with round-the-clock care, including placing him on oxygen to help his body heal. Once he was stable, eating and gaining weight, he was embraced by a foster family who helped him recuperate and reach a healthy weight, and gave him the loving home environment he deserved.